Description of "Manifesting Soft Power Management"
'Manifesting Soft Power Management' is a must for all Managers and Team Leaders, who may be working in any Industry or Forum. 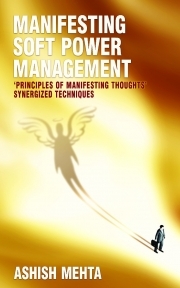 The efficacy of this book comes from synergizing the Principles of Manifesting Thoughts with Soft Power as well as Managerial techniques. This book helps to open up the creative power of the mind to be constantly working in harmony of the Conscious. To grow further as managers and graduate to mentors and to leaders, is what this book guides in. Ashish Mehta, Chief Mentor of AshMehta & Associates, has 23 years experience as an Advertising & Service Industry professional, consultant, entrepreneur, corporate trainer, professional coach and author. He is also a spiritual helper, having practiced Pranic Healing, Arhatic Yoga and various meditations. Ashish brings forth the teachings of Law of Attraction, Thought Management & Visualization by synergizing & empowering most important day to day techniques to win in the corporate world, the social world and the inner worlds - known as the ‘Manifesting Thoughts’ techniques. ‘Manifesting Soft Power Management’ is the third gift of love from the stable of ‘AshMehta ~ Manifesting Thoughts’. The unique trainings of synergizing Corporate and Life Skills with the Law of Attraction were unheard of before. The resultant success of students who have undertaken the trainings have been phenomenal. This book which you hold in your hands right now is a pioneer in a manner of speaking. The author’s first book ‘Manifesting Thoughts Effortlessly’, which explained the How’s and Why’s of the Law of Attraction has been widely accepted and acclaimed across the globe. The second book ‘Manifesting Impressive Public Speaking & Presentation Skills’ has helped a large number of people to overcome their fears and successfully use the techniques prescribed in gaining stature at their official and social meetings and conferences. The effort of the author is to share his insights and make life worthwhile and live a complete rounded existence. Reviews of "Manifesting Soft Power Management"